Things didn’t bode well for the bridal-gown-shopping excursion. The weather forecasters weren’t sure how much snow the storm would dump on New York City, and the bride had to travel down from Albany. One bridesmaid would be coming in from New Jersey. Another bridesmaid (my niece) and a flower girl (her five-year-old, my great-niece) live in Boston, which everyone knew was going to be hit hard. Taking a good guess that school would be cancelled for Friday, my niece and her family made a getaway Thursday night to her brother’s home in CT, and were safely ensconced in a midtown NYC hotel by Friday afternoon. When my daughter got on the 4:15 train on Friday to the city, I was feeling better — even though the legendary Kleinfeld’s had already emailed her that they might have to cancel her appointment because they might not be able to open the store. 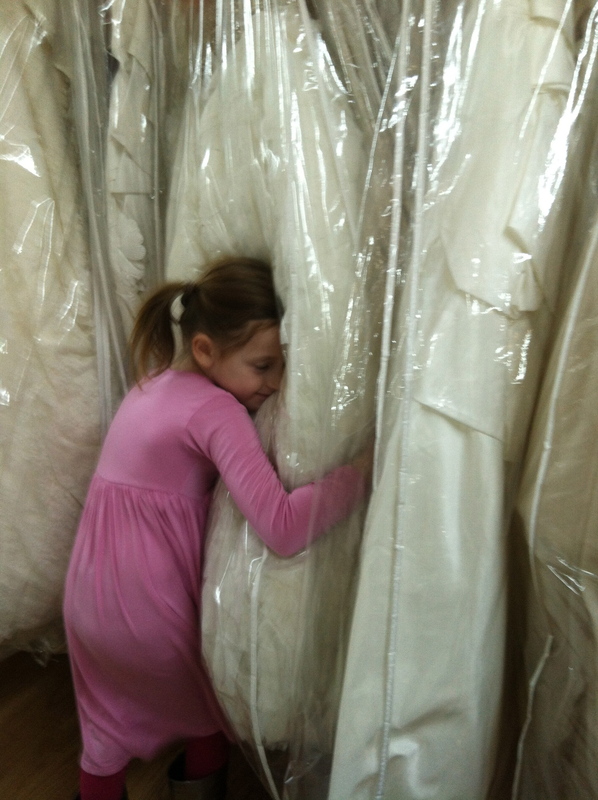 There are, after all, many bridal stores in New York City. And thank goodness for that. Manhattan was largely spared the snow — on the Upper West Side we had about 11-inches, although Brooklyn Heights came in at 2-inches. The subways were running. We all own boots. Only my daughter’s mother-in-law-to-be hadn’t made it in. And, yes, Kleinfeld’s had cancelled. But RK Bridal was open. This store bills itself as “no-frills,” and certainly is. The dressing rooms are not fancy. They don’t offer the bride bottled water. Over a thousand dresses hang on racks (in plastic), grouped by designer. It could be overwhelming. From the moment we walked in, however, we were made to feel at home. Because of the slush, we all had to remove our boots, For those of us who forgot shoes (um, moi), the store provided slippers. They did not fuss that my daughter had an entourage of eight. They did not mind that we all dumped our coats in the dressing room. The staff was cheerful and relaxed. Kudos to my daughter who came prepared with pictures of gowns she liked (which I had printed out for her). I am also in awe of our saleswoman who grabbed the gowns my daughter liked off the floor, found similar ones for her to try, and then, in an act of brilliance, produced a gown of a type my daughter had totally nixed, but which fit in with my daughter’s sense of style and also emphasized her best features. That was the dress. What they say is true. When she tried it on, she knew it, and we knew We applauded, and so did everyone else in the store. I cannot post a picture of this wonderful bridal gown my daughter will don in September because if I put it on the Internet, somehow her fiance may see it — and we can’t have that, right? I continue to be amazed at what a wonderfully easy bride-to-be my daughter is, so different from the bridezillas we watch on television shows or read about in magazines. For me this mother-of-the bride experience is exhilarating and exhausting. I’d love to hear from others, both brides and mothers, about the special moments in their wedding planning. If there were disasters, well I guess I better hear about those too. Thanks. 12/16/12 I don’t know what it is about winter vacation, but Howard, who does not love going to the movies the way I do, suddenly agrees to see almost anything I suggest. Blame our sudden film buff frenzy on ease of access. When we’re at our house in Chatham getting to the movie theater seems less difficult than it does in New York City, though in actuality, that’s not true. In the city, we can walk to many movie theaters. Here we have to drive. But the ticket prices outside of the city are certainly cheaper. And except for Christmas Day or the opening of a blockbuster new film, we can be pretty sure of getting tickets right before the show. If we want to see a movie in New York City on a Saturday night, we have to make sure we have bought tickets (over the Internet these days or even with a phone app) by 10 a.m. that morning. Part of the charm of going to the movies in Chatham, NY is the Crandell movie theater, a relic from the old days of small town theaters. Though the place was fairly decrepit from the first time we went there over 20 years ago, the price was right: I believe in 1995 or so adult tickets were $3.50. They now cost $6. Also, we just drive into town a few minutes before the movie starts, and go to the window, and slip our money into the till. They show a lot of junk — they need to make a profit. But most of the really good films play there also. It’s mostly a matter of being upstate (and being free) the same weekend there’s a movie we want to see. 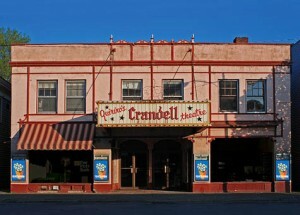 A few years ago, the owner died suddenly, intestate, and the theater closed for several months while the family negotiated with Chatham Film Club. Backers like the Ellsworth Kelly Foundation (yeah, famous artists can be community minded) put together enough cash to buy the building. Local businesses have provided fuel, paint, and workers. The seats have been replaced, and the whole place feels spruced up. So we went to see The Hobbit right before Christmas. Unlike most of the world, at least according to box office figures, we didn’t like it. We both felt that Jackson had melted Tolkien’s magic into a huge video game with obvious jokes and overdone battle scenes. Gollum is amazing, though. Seeing anything at the Crandell, though, is fun. We’re wondering what’s coming next. Strangely, those awful moments may be what the parents of the children who died remember as the last “normal” moments of their lives, the hours and minutes before they knew for sure. When our 26-year-olds drive back to Albany on I87 and it’s already past dark and besides that it’s cold and rainy — possibly even cold enough for the rain to make the roads slick — we call them to make sure they arrived home safely. It’s what we do as parents. We love our children. We do everything we can to protect them. It’s what the parents in Newtown could not do and why we are all at such a loss about how we should respond. A woman with a mentally ill son writes a blog that goes viral. It seems to speak to us all. Raising a violent child is a nightmare, and there are not enough resources available to parents who fight this battle. Yet the post also enraged many people because it once again opened a door to the anti-gun-control apologists who say, “Guns don’t kill people. People kill people.” I saw many rants on Facebook by people furious that the blog was getting so much play. Still, what can we do that will really help the town? If we’re NY Giant football player Victor Cruz, we can write a victim’s name on our shoes and go talk to a dead child’s team and give some comfort. The rest of us? Well some people changed their twitter avatars to pink daisies in memory of one of the little girls who loved daisies. Others are making cut out snow flakes from paper to decorate the new school where the kids who survived the massacre will return to school in January. At first I found these gestures annoying. It’s not like sending teddy bears or daisies to Newtown, CT will actually do anything that will effect change. It was different after Hurricane Sandy. We could give money to the Red Cross, and they would use it for victims. We could go help out in shelters. We could dig the sand from people’s basement floors. We could take action. For Sandy Hook, it’s inaction that will speak, a moment a silence. 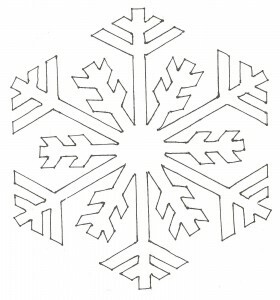 Cutting snow flakes and sending them to the Newtown schools — I finally figured out that a piece of paper also speaks volumes. It says we care. It says, yes, our kids are here with us (or away from us), safe. Yes, it’s unimaginable to think what those parents went through, those parents whose children never came out of that school. 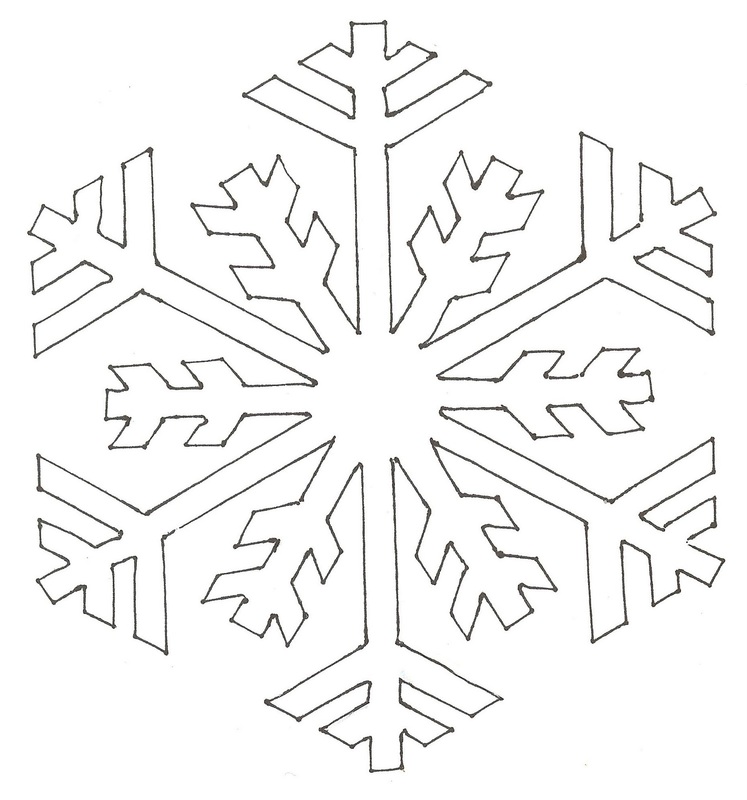 A snowflake, a pink daisy. Small gestures. It’s all we have to give for now. That and our voices and signatures and votes that will ensure that the kinds of guns and ammunition that aren’t even used by police or by hunters will not be available the next time someone, insane or just angry, decides he or she wants to kill people. 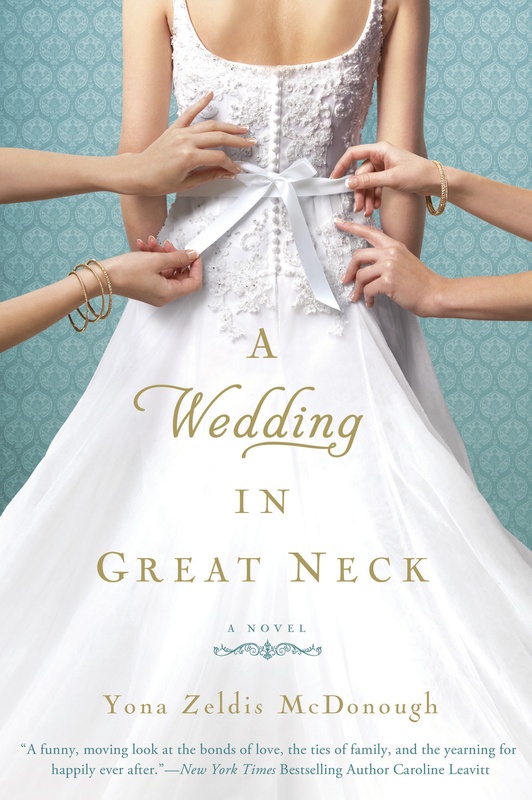 11/5/12 I’m not sure if I finished reading A Wedding in Great Neck by Yona McDonough in one night because I had insomnia, or if I had insomnia because I wanted to finish the book — because once I started I couldn’t put it down. McDonough uses a wonderful technique where the story unfolds from several points of view – the grandmother, the mother, the sister and her estranged husband and others. Only the bride’s thoughts are a mystery as the hustle and bustle of the wedding day unfold. The comedic episodes entangle with serious issues. And always there is drama because the characters all manage to be divas in one way or another before they pull themselves together into a portrait of sensitivity and sensibility. 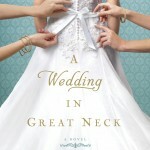 McDonough paints a true-to-life portrait of a family with many issues and clashing personalities who discover that for all of them, it’s the bride and her happiness that matter. I also think McDonough has an uncanny ear for speech and a terrific gift of story-telling. I don’t want to say more or give away the plot – but I will add that the grandmother with the bra-shop, I want to go have her fit mine. Each page is delicious. Enjoy. 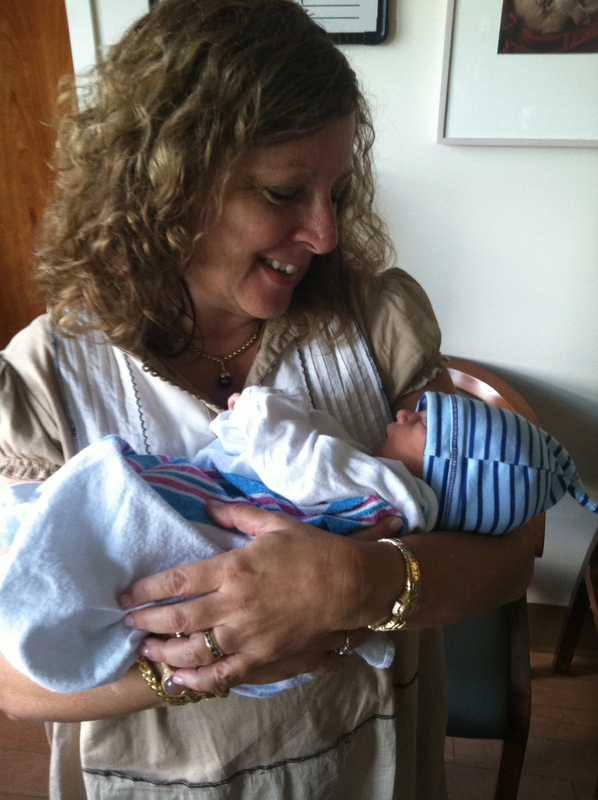 9/9/12 So my daughter’s best friend from college had a baby yesterday, and being that this young woman calls me her “New York Mommy” and that her parents aren’t flying in from the West Coast for a few days (and she has no family here), hubby and I paid a visit to the maternity ward at Mt. Sinai hospital. (An aside: Going anywhere by bus on a NYC Sunday can take way too long.) As most of my readers know, I blogged last week for PBS’s website for Baby Boomers, Next Avenue, about wanting to be a grandmother. I have a grandpuppy, and I used to have grandferrets (they died at age 5 1/2, old by ferret standards, having lived a wonderful life with my son as their ferret-in-chief). Seriously, I’d be pretty shocked and slightly taken aback if either of my children announced that there was an imminent grandma coronation in the works. I do want my young adult kids to settle better into their professional lives before they bring other lives into this world. But, ah, I love children. I love babies. And I love Danielle for letting me hold Jax for a few minutes. Neither Danielle or her partner, Chris, have much baby experience. As we walked in, they announced that they had changed their first few diapers and were getting good at it. Yeah, I know that they’ll have to learn to cope with lots of interrupted sleep and that they’ll have to find ways to comfort Jax once he stops sleeping all day. (That should happen in about two weeks, if my memory is correct.) But the joy on their faces, in their every movement. This is a happy couple. This is one lucky kid. His real grandparents – well they’re great people. Mazel Tov all around. "But I actually use @waze in traffic jams. How should I feel that #Google bought it? http://t.co/w1paWg4b6E #mapping"
Amy Robinson on WE LOVE TOY KITCHENS! MrsSerz on WE LOVE TOY KITCHENS! MissyP on WE LOVE TOY KITCHENS!